Since I started my Personal Video Blog back in November, I've had tons of questions about my video editing hardware and video editing software - and about video editing in general. Which I personally think is a hack job half the time. LOL. I often joke that I'm a technophobe, but the truth is I don't have time OR patience to learn complicated software or hardware. If it's not quick & easy, I'm probably not doing it. 😛 Which is why I chose the video editing hardware I did. It is the EASIEST video editing software I have ever used in my life! I tried other programs in the past, Camtasia etc, but nothing compares to the simplicity of iMovie. Even for a total newbie. I'm still running PC's in my home office, but got the Macbook specifically for mobile video editing. That was the best decision I could have ever made! It has a flat bottom, which is great for setting up anywhere, and it has a flip-out touch screen too. The flip-out screen was a must for me as I do a lot of self-video, and it's impossible to frame yourself correctly in a video if you can't see the screen! It also comes with a remote, which is GREAT. Especially if I want to be further away from the camera with an external mic. You can use the remote to zoom in and out too, in addition to stop/start. Very nice! I've been told the Canon Vixia is not AS simple with PC's, but I have never tried it. With the Macbook it just plugs in, imports, is ready to edit, and you can upload straight to YouTube from there! Everything is very mobile, and it all fits right in my camera bag - except the tripod, which has it's own carrying case w/shoulder strap. The extended life battery pack is a MUST in my opinion, by the way. It gives me well over two hours of shoot time, and it means I always have a spare charged battery in the bag. It comes with it's own wall charger as well, which works with both batteries. The external mic has a super long cable, and is "plug & play". No special settings or buttons required! I simply plug it in, clip it on, and go. Here is the rest of my Home Office. I hope that answers some of your questions about my video editing software & hardware, how I do the cool transitions & scenes, etc. Of course, if you have feedback or questions... I'm all ears! Just leave a comment below. Thanks for your feedback and experience L.M. Interesting stuff and inspiring for my own work. Interesting advice Lynn, thank you. I'm at the stage of having a list of a few thousand and a YouTube channel of people who know me under my real name. That said, I think I can start to phase myself out of the business and use my blog name as branding. I'll ultimately be selling most of my properties (in a few years) so this is probably better. Canon Vixia seems to be a good line. TWIT.tv uses about 30 model HF G10s as studio cameras, but never for internal recording. Leo said the output quality is actually better than what you get from internal recording. Are you concerned about lighting? Was stressed at pricey CA event few months back with lighting and the whole gig. I have hard time propping up my Mac with the right set up still. Stacking yours on books or...? Have you tried using an IPOD touch or Iphone vs. Canon since I own the touch? I do own Canon Powershot that records but haven't used that. Ipod is always with me. Thanks Lynn! You lost me. 😀 I don't record videos with my Macbook, I just edit them. I use the Canon Vixia camera to record. So I'm not sure what you're asking? As for lighting, no I am not concerned at all - and I haven't invested in any lighting equipment. I prefer to shoot my videos during daylight hours when it permits as it gives me the absolute best light. I always face the source. I do have a "grow light" which is a basic metal clamp with a "grow bulb" that I got from Lowe's which helps if I want to do videos in rooms with little light or after dark - but it tends to throw shadows if you're not careful. So I try to stick to sunlight - which is cheap and readily available. 🙂 Overcast days are even better! On another note, I use the Audio Technica lavalier mic and also the Audio Technica wireless system. Absolutely love them both! I know yesterday there was a comment from one person saying he thought using the Canon Vixia with a PC was a breeze. I think the difference is based on the software each person is using. The video format for real HD is not used by many of the more common editing programs. They cater to the more common and affordable camera formats (heard that directly from Canon). I have a feeling that may be why it's easier for him - seems like he's using one of the top level software programs. Can it be done on a PC? Sure but it takes much too long - too many steps! When you know there's a simpler, more productive way to go - that's the road I want to take. So...the Mac it is for my video editing after Saturday. I agree with you on the Mac. It is so easy to use and I've used it and only it for videos. They come out fine - especially for someone just beginning in video contact. And yes, as Matt says, you do have ease in front of the camera. Did you develop that along the way? I think it is naturally a part of you. I started the video blog for a number of reasons, but mainly because I wanted to share "the real me" - outside of marketing and business - so it is much easier to be natural and let my hair down so to speak. p.s. I will say, too, that I was painfully shy up until my early 30's. I am an introvert by nature, but no longer shy - and have really enjoyed pushing my limits in the last few years (video, public speaking, etc). Lynn - going off topic a little, but I just spotted this on your post. Do you use a Plugin for G+ button at the top and the same question for the FB Share button. If so, are you able to tell me what the Plugins are called? Lynn - Thank you very much for this. It's because I haven't been able to find one that grouped these all together in the same place, that I asked. I just switched to the larger icons. You saw the smaller ones before - you'll have both options when you install the plugin. Good stuff! Those two things are on my future wish list LOL I would like to start doing video but when it comes to the techy stuff, well, I'm so not good at that. I'll have to practice if I want to get it done. I'm not either. I have no patience for it lol. That's why I went the easy route. 😛 But even with the easy way I do it, practice is definitely helping! One easy trick with flip cam. Use a music stand with a mirror behind the tripod. Works, and is cheap. I really liked your videos. 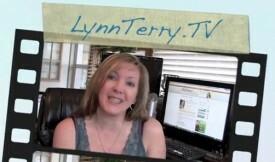 Straight to the point, full of tips, and your have a friendly tone, and a great voice! The best guide for video editing by far on my list this year. I'm looking for specific instructions on how to rotate the angle of my video. Do you know some suggestions? I'm not familiar with that. You might talk to Oliver Olsen of Speedy Web Videos. I gave his link at the end of the post - he's my go to video guy. The one take-away idea from your videos was to do a deliberate pause between "chunks" -- and just repeat anything you didn't get just right, with pauses to make them easier to edit. Post-processing the video on the Mac is much better than trying to record 5-8 minutes of something with no errors. I kinda wondered about all the transition effects you used, but now it's obvious what you were doing, and it makes brilliant sense. It was one of those "DOH!" moments for me. Thanks, Terry! I do find it much easier. There's no way I could do it right all the way through LOL. And the transitions help to keep the attention when viewing, breaks it up a bit. It's nothing earth shattering, but it does cover the basics in just over 6 minutes. Thanks! I had a hard time getting my PC to handle the HD video, when I went to an HD camera. It was a bit rate issue or something. Very frustrating. Went to check out that camera. $700? Ouch! I, too use a Mac with a Canon Vixia camera but Canon said it was not supported on Mac OSX. I've been having to transfer the files to a different format (other than the AVCHD the camera shoots) to use them on the Mac. How are you getting it to work without file conversions? You went over my head, Michael - LOL. I have no idea. I have a basic Macbook Pro 13.3". I record the videos on the camera, plug in the USB cable, and they transfer straight into iMovie. Are you using iMovie? Adobe has a good and widely-accessible software. An alternative would be Vegas, which is more user-friendly. These two are popular with amateur filmmakers and film students. Great article. I also use iMovie, Vixia HF-10 HD video camera and have the AT mic with extra batteries. The video from the Canon is impeccable. Course when I bought mine it was the first model and it cost $1,300 but I have loved it and it's available for a lot less currently. iMovie is just great. I use it for 3 years now, and I am still pleased about the simplyness and usability. Of course sometimes it reaches its limits but for most videos its just enough. I like working with it. 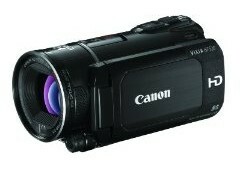 The Canon Vixia HD Video Camera is one hell of a camera... quite expensive though. Video, but you are a great Mentor. Regards. Lynn, I totally just bought the Audio-Technica ATR-3350 Lavalier Omnidirectional Condenser Microphone from you Amazon link. Thank you for the review and thank you for the tips. Best wishes to you and yours! Cheers!